Ethical standards for publication exist to ensure high-quality scientific publications, public trust in scientific findings, and that people receive credit for their ideas. BluePen Journals is a member of the Committee on Publication Ethics (COPE) and abides by its Code of Conduct and aims to adhere to its Best Practice Guidelines. All journals published by BluePen Journals are committed to publishing only original material, i.e., material that has neither been published elsewhere, nor is under review elsewhere. BluePen Journals as a participant of CrossCheck uses the iThenticate software to detect instances of overlapping and similar text in submitted manuscripts. Manuscripts that are found to have been plagiarized from a manuscript by other authors, whether published or unpublished, will incur plagiarism sanctions. Immediate rejection of every other manuscript submitted to any journal published by BluePen Journals by any of the authors of the infringing manuscript. Prohibition against all of the authors for any new submissions to any journal published by BluePen Journals, either individually or in combination with other authors of the infringing manuscript, as well as in combination with any other authors. This prohibition will be imposed for a minimum of 36 months. Prohibition against all of the authors from serving on the Editorial Board of any journal published by BluePen Journals. In cases where the violations of the above policies are found to be particularly egregious, the BluePen Journals reserves the right to impose additional sanctions beyond those described above. 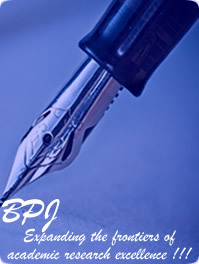 The BluePen Journals ethics committee is an independent committee that is responsible for supporting the various editors in resolving issues that infringes on this editorial policy. The ethics committee shall be made up of five editors selected from different journals published by BluePen Journals. Authors should read the �Instruction for Authors� on the journal�s page before making a submission. Manuscript should be prepared according to the style and specifications of the journal�s policy. �Conflict of interest (COI) exists when there is a divergence between an individual�s private interests (competing interests) and his or her responsibilities to scientific and publishing activities such that a reasonable observer might wonder if the individual�s behavior or judgment was motivated by considerations of his or her competing interests� WAME4. A submitted manuscript is a confidential material. BluePen Journals will not disclose submitted manuscript to anyone except individuals who partake in the processing and preparation of the manuscript for publication (if accepted). These individuals include editorial staff, corresponding authors, potential reviewers, actual reviewers, and editors. However, in suspected cases of misconduct, a manuscript may be revealed to members of BluePen Journals� ethics committee and institutions/organizations that may require it for the resolution of the misconduct. BluePen Journals shall follow the appropriate COPE flowcharts wherever necessary. BluePen journal operates a blind peer review system. Manuscripts are assigned to members of the editorial board of the journal or other qualified reviewers. The Manuscript Review Form is used to report the reviewers� evaluation of the manuscript. Editors are responsible for making final decisions on a manuscript. BluePen Journals require all editors and editorial board members to adhere to COPE Code of Conduct and Best Practice Guidelines for Journal Editors. Interference with the editorial freedom of editors construes misconduct. BluePen Journals strictly forbids the interference with the editorial freedom of any of its editors. Suspect cases of interference will be reported to the ethics committee. To join an editorial board of a journal published by BluePen Journals, a prospective board member should have completed a doctorial programme. The area of expertise of the prospective board member should fit with the aims and scope of the journal. The applicant should also have research experience and publications in his/her area of expertise. BluePen Journals will review and update this editorial policy periodically.